Sussex Police are warning residents to be cautious of cold callers offering relief from nuisance phone calls after a spate of recent reports. The force says it has received reports of fraudulent sales calls encouraging householders to subscribe to costly call blocking or telephone preference services, which charge a monthly fee. However, police say, the services offered will not block any unwanted calls, and could even place personal information into the hands of criminals. 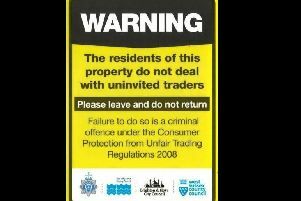 Detective Chief Inspector Tracy Edwards said: “We encourage all our residents to be extremely wary of cold callers, but these fraudsters are extremely cunning in offering pretending to offer relief from unwanted callers – at a price. “If you receive a phone call from anyone offering to block unwanted calls, do not give or confirm to the caller any information at all - refuse even to give your name, address, and your bank - and put the phone down. “Then contact Action Fraud - or us at Sussex Police if you are elderly - with the details of the call. During September and October, ten reports to Action Fraud and Sussex Police involved fraudsters asking Sussex residents for payments and monthly subscriptions for call blockers, ranging between £20 – £200. In seven cases out of the ten some money was paid over. For genuine call blocking and telephone preference services, police advise to signing up to the free Telephone Preference Service (www.tpsonline.org.uk) which offers one level of protection. Other options include call blocking devices approved by ‘Secured by Design’, such as trueCall devices (www.truecall.co.uk). If you or someone you know is vulnerable and has been a victim of fraud or an attempt at fraud, call Sussex Police on 101 or visit www.sussex.police.uk. If you need to a report fraud or attempted fraud, you can do so by contacting Action Fraud at www.actionfraud.police.uk/report_fraud or by calling 0300 123 2040.